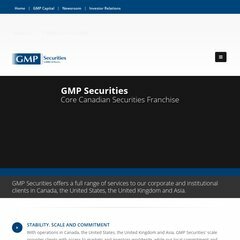 www.Gmpsecurities.com - GMP Securities L.P. The site has about 103 users daily, viewing on average 3.70 pages each. It is hosted by Q9 Networks Inc (Ontario, Toronto,) using Microsoft-IIS/6 web server. The programming language environment is ASP.NET. Its server speed is measured at 1092 milliseconds.